A Voice Print – a recording of the range of notes that your voice expresses as you talk normally – captures your whole Energetic Matrix and creates a visual representation (a graph) of your complete frequency be-ing. A voice print can reveal discrepancies in the body (physical, mental, emotional and spiritual) long before physical symptoms begin to show themselves. Voice printing thus enables early detection and correction of imbalances, well in advance of anything manifesting in the physical body. 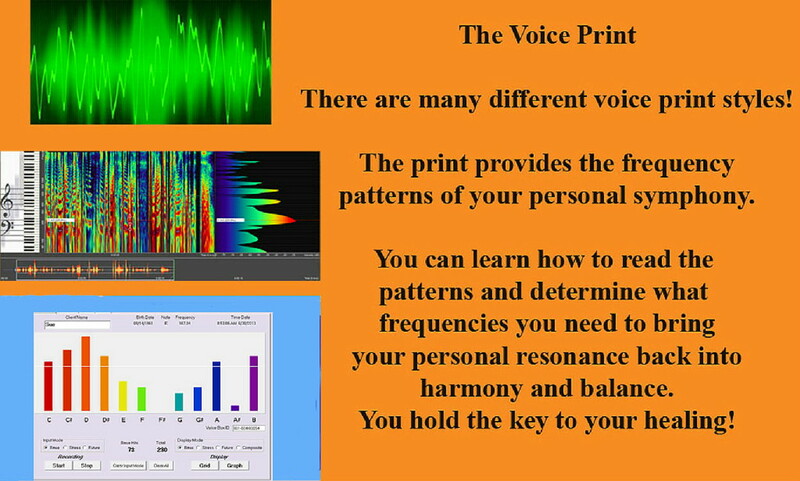 There are many different voice print styles, but they all provide frequency patterns of your own personal symphony. They are simple, graphic representations of your energy make-up. You can learn how to read these patterns and determine what frequencies you need to address, to bring your personal resonance back into balance and harmony. Using the voice print, you hold the key to your ongoing health and well-being. If you wish to learn more about this empowering process of self-care, please get in touch with us (Secure Contact Form on the right). We are now living in our new home, the beautiful and peaceful Big Island of Hawai`i, where the Aloha Spirit resonates so beautifully out into the world. Due to this change, our training classes / locations are under complete reconstruction. Should you wish to gain deeper knowledge about Vibrational Medicine and Sound Healing, either for your own use or as a practitioner, do get in touch and let us discuss all options. These are times of enormous change for us all, and we are vibrantly open to new pathways and opportunities to share this healing knowledge – with You! We love to travel to bring our Training Classes to other areas. Please contact us (Secure Contact Form form on the right) to discuss a Training Class in YOUR location.